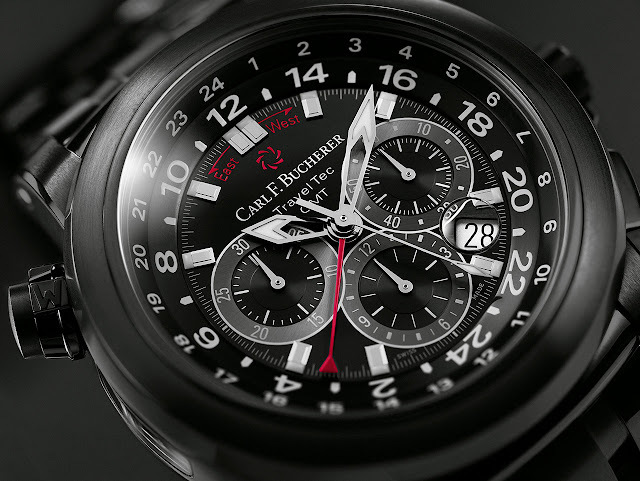 Carl F. Bucherer delivers a timepiece that is finished to the highest standard. First the exterior: the stainless steel case benefits from a DLC (diamond-like carbon) treatment that confers a compelling, deep matt black aspect. This crystalline carbon coating, applied in layers, has a structure similar to that of diamond. This guarantees a continued intensity of colour over time, as well as exceptional scratch-resistance and resistance to shocks. 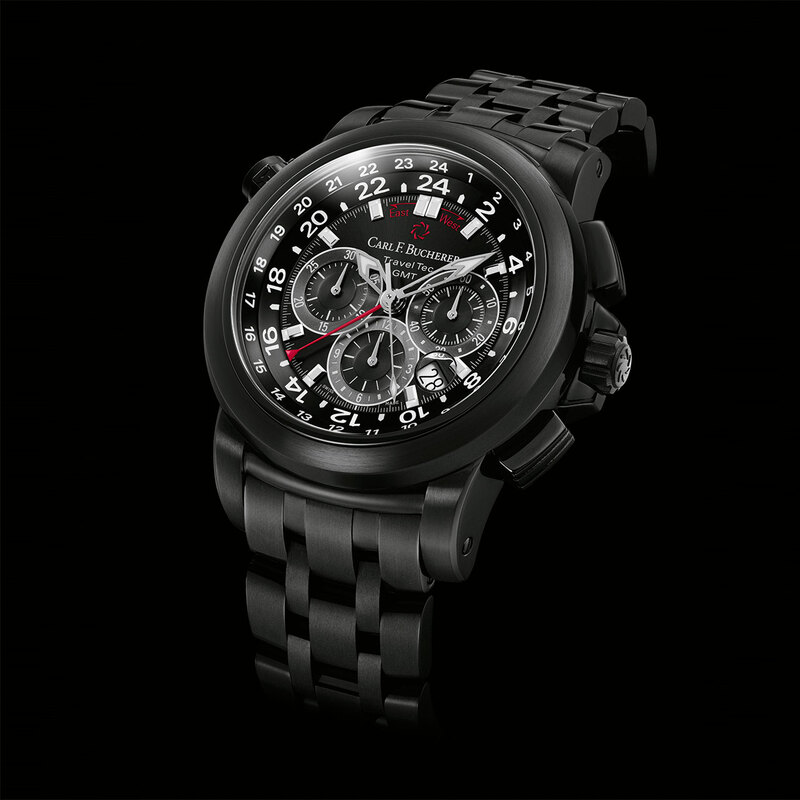 As for the movement, in addition to a chronograph function, the TravelTec Black displays a triple time zone. To achieve this, the watchmakers have literally merged the COSC-certified movement with the case: a patented pusher at 10 o'clock pivots an inner bezel, which is graduated for the third time zone over 24 hours. The other two time zones are displayed on the dial. Mechanical automatic, calibre, chronometer-certified by the COSC, CFB 1901.1 calibre, 39 jewels, 42-hour power reserve. Hours, minutes, seconds, chronograph, date, triple time zone. Black DLC-treated stainless steel, 46.6 mm. Screw-locked crown, anti-reflective sapphire crystal. Water-resistant to 50 metres (5 bar/165 ft). 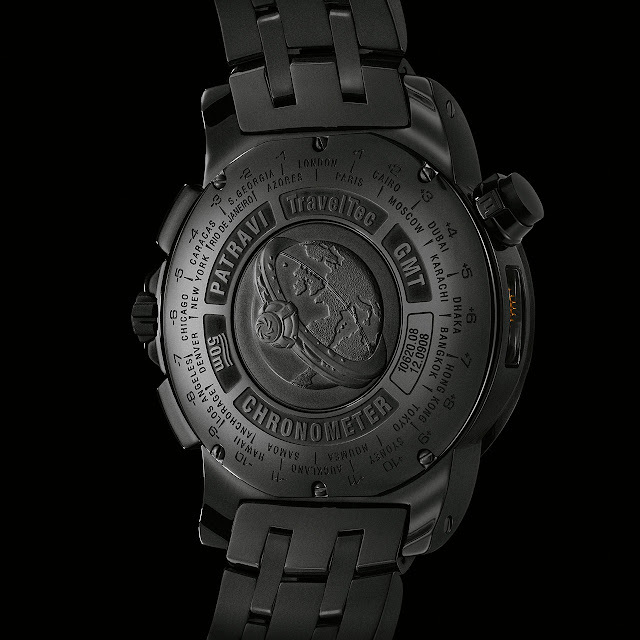 Black with seconds counter at 3 o'clock, 12-hour counter at 6 o'clock, 30-minute counter at 9 o'clock, date between 4 and 5 o'clock, 2nd and 3rd time zones by a central red hand, 24-hour rotating bezel for the 3rd time zone. Black DLC-treated stainless steel, folding clasp.